The editor of several best-selling books, Andrew Carroll has joined forces with David Fischer, executive director of the Broadway Center for the Performing Arts, to bring Tacoma stories from his book Operation Homecoming: Iraq, Afghanistan, and the Home Front in the Words of U.S. Troops and Their Families. The book’s title may not roll off the tongue, but the stories are touching accounts of war. Fischer explained that the book, published in 2006, was made possible through a partnership with the National Endowment for the Arts. Nationally renowned writers such as Tom Clancy worked with service members and their families across the country in workshops to develop the stories. Hundreds of stories were accepted for possible publication in the book, and Carroll was the man responsible for selecting and editing the stories. For the past month, the Broadway Center accepted stories from local Iraq and Afghanistan veterans and their family members, who have endured lengthy deployments. Carroll agreed to select the best local stories and edit them for inclusion in the live performance of Operation Homecoming at Theatre on the Square tonight. Fischer expects the show to contain several local stories, but a majority of the stories will be from the national community. Paul Rieckhoff’s book, “Chasing Ghosts: Failures and Facades in Iraq: A Soldier’s Perspective,” is littered with expletives, graphic imagery and an uncompromising look at the situation in Iraq. A graduate of Amherst College and a former infantry officer in the Florida National Guard who served with Bravo Company, 3rd Battalion, 124th Regiment, 1st Brigade, 3rd Infantry Division in Baghdad from 2003 through 2004, Rieckhoff wrote the truth. Surprised and offended by that sentence? Happy that someone is writing in a manner that could metaphorically describe how the war in Iraq has been handled? Either way, Rieckhoff wants to … and grabs … your attention. He wants you to think. When he returned from Iraq, Rieckhoff vowed to do what he could to serve the interests of the men and women who have fought in Iraq and Afghanistan but have not received the support they deserve from the government or the public. In writing about the current administration, he pointed out that former Secretary of Defense Donald Rumsfeld and his planners would not listen to Gen. Eric Shinseki when warned about invading Iraq with only 150,000 troops. Rieckhoff also zeroed in on L. Paul Bremer, the former administrator of the Coalition Provisional Authority. He disbanded the Iraq army and civil service, thereby creating 400,000 unemployed Iraqi soldiers and civil servants who could be induced to work against American interests. Rieckhoff’s point? Currently, we are involved in a “surge” to put down an “insurgency” which may have been avoided if the president and the former secretary of defense had listened to what others with military experience were saying. For the past five years the present administration has tirelessly told the public that the country is at war against terrorism. Rieckhoff finds such talk fatuous. Except those serving there now and the loved ones they leave behind. “Idiot. He seemed to think he was doing play-by-play at the Super Bowl,” continued Rieckhoff. “Our war was just another car chase or celebrity trial for him to cover,” he added. Later in the book, Rieckhoff writes that embedded journalists and photojournalists (whom he called “jock-sniffers”) are protected and pampered purveyors of half-truths. There are journalists and photojournalists (myself included) who embed and work very hard at writing accurate stories or filing truthful images. Labeling the press as “jock-sniffers” is just plain stupid, and Rieckhoff knows better. The images in “FOCUS: Through the Lens of a Soldier” are on target about the war in Iraq. Walter Gaya served as a sniper in northern Iraq with 1st Battalion, 24th Infantry Regiment, 1st Brigade (Stryker Brigade Combat Team), 25th Infantry Division in 2004 thru 2005. The images he took capture the reality of men in combat. He also returned to Iraq for a couple of months in 2006 to take more images portraying the lives of ordinary Iraqis. The 108 page self-published book contains 61 images. The majority of them are in black and white; all of them convey an edgy and gritty sense of life and death, pain and joy. He photographed like a sniper … with a purpose. Gaya says that something in him drives him to make documentary images. His style is reminiscent of Robert Capa and Richard Avedon, two noted photojournalists. “There was no way I could go there and not record what was going on around me,” he said recently as he relaxed in the bakery he owns with his wife in downtown Tacoma, WA. 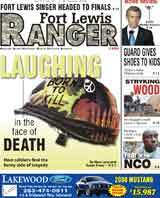 “This book is a piece of history depicting the lives of the ordinary ‘joe’ serving in Iraq,” he added. The images run the gamut from Iraqi children smiling while giving the thumbs up sign and a soldier drawing a tattoo on another soldier to the charred remains of an insurgent and soldiers giving aid to wounded Iraqis. Always present is the harsh reality and loneliness that soldiers face. One image shows a soldier sitting on two concrete blocks in an empty room looking through a laser range finder. His weapon, assault pack and helmet are to his right; bullet holes in the wall above and behind him; the floor covered in dirt and debris. Another image that haunts is a slightly out-of-focus image of the bed on which there are a soldier’s weapon, a heart-shaped candy box and a stuffed dog. Clearly focused is a flag with the words “Don’t Tread On Me” on it. It is the bed of a soldier who was killed in action. On the other side of the world …. Several images were shot in Olympia, WA, of individuals who protest the war. One particular telling shot shows the back of a man walking around a coffin-shaped box covered with an American flag. All of the images described here are black and white; however, they convey the color of both those who fight and those who protest the war. Gaya’s work is right on target. 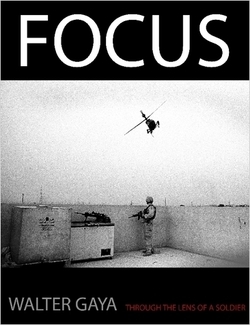 “FOCUS: Through the Lens of a Soldier” can be purchased at lulu.com/content/725090. With each purchase, Gaya donates one dollar to the Fisher House, an organization that helps military families whose loved ones are receiving medical care.